Horng Dar Marine Enterprises Ltd. The bulk of the China Merchants Steam Navigation Co. was seized by Taiwan in 1949. Thereafter the fleet appeared in Lloyds as China Merchants Steam Navigation Co. Ltd. based in Taipei. In 1972 the fleet was placed under the newly formed Yang Ming Marine Transport Corporation though Lloyds have ever since continued to show the company as still operating with a certain amount of obvious confusion with the Hong Kong company of the same name. However it appears that the company does [at least up until 2005] continue to exist though its "fleet" now consists of the 109T tender "Tar Shieh". According to Stewart 1963 [ste63] its flag after shifting to Taiwan was based on the Merchant Ensign being red with 4 horizontal wavy yellow bars but with the canton left clear and on this was placed the yellow disc. 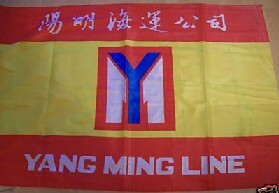 There is the house flag of the China Union Line, a former Taiwanese shipping line established by C.Y. Tung of OOCL fame. Source: Colin Stewart & John S. Styring, Flags, Funnels & Hull Colours, Adlard Coles Ltd. 1963. It possibly is, or may only be similar to, the flag of Concord Navigation Co. Ltd. which is shown by Brown 1978 with the diamond being throughout and the letters erect. This company seems to have operated in the late 1960s so depending on whence this version has been sourced, it may only be coincidence. Taipei - white flag, green 8-pointed star (slightly shifted). Container ship company founded in 1969. Using the funnel as a guideline Brown does not correctly portray the star and the four main points should be longer. There also appears to have been a change in the design going by a table flag appearing on Dunelmpr.co.uk which shows the logo which now appears on the company website being placed on a white field [see abive]. Whilst not sure that this is also used for a sea flag, the design has also been photographed on the funnel of the Ever Gaining in December 2005 suggesting that a change is underway and the flag is for general use. Kaohsiung - blue flag, double indented red rectangle bordered white. Taipei - green flag, white "N". Taipei - Israeli-style White-Red-White-Red-White flag, in center interrupted by the firm's logo. Taipei - orange flag; a bastion of five bulwarks, outlined white, white "T". Taipei - horizontal Yellow-Red-Yellow flag, in center the firm's emblem. Apparently this Taipei based firm was founded in 1946, becoming Ltd in 1949, TNC now operates about forty ships, mainly bulk carriers plus a few container ships, a passenger ferry, various tugs, and push boats. These are used locally as well as internationally. The house flag (a drawing) seen flying on the main website is rather striking: I suppose it is the successor to the previous flag. Vertically divided dark blue-orange-dark blue, two white bird silhouettes - both oriented towards the hoist - are placed on the dividing lines. Taipei - horizontal Blue-White-Blue flag; in center red "U", interrupted by three blue waves outlined white. Wan Hai Lines Ltd (Taipei, Taiwan) - Black W on white. Further evidence that the "W" on the white flag is dark blue and not black has been obtained from a ship photo on the company website which shows it being flown as a bow jack. Surprisingly another of their ship photos shows a bow jack version which has a light blue field bearing the dark blue "W". Taipei - horizontal RYR, proportioned c. 1:3:1; in center red square, blue "Y", white interruped "M". Part of the Yang Ming Group. Founded 1972. Yang Ming is transliterated from its two Chinese characters. "Yang Ming" refers to the sun and lightness. "Yang" refers to the sun, whereas "Ming" is the combination of the sun and the moon and often denotes "brightness," "clarity" or "enlightenment." The logo is a square block shape integrated with our initials "YM". The "Y" stretches out from the bottom to the top, which signifies Yang Ming's endeavor for innovation. The "M" stands for grandeur, width and firmness, which implies that Yang Ming's employee teams work honestly and pragmatically for effective results. Our logo also delivers Yang Ming's core values of "Teamwork, Innovation, Honesty and Pragmaticism." Brown [lgr95] has not got the panel quite right and going by the funnel bands the yellow is a golden shade. This photo is of a variant with writing in Chinese and Latin characters, something you would rather expect of a table flag. This, however, is a life-size item. Added to the lower red stripe is the name "YANG MING LINE" in white (no serifs) and to the upper red one the same (I suppose!) in white Chinese ideograms. Source: German eBay offer no. 360132240198 (end 26 Feb 2009) put up by "kaethedorsch1" who also provides dimensions: approx. 0.93 m x 1.40 m.
A horizontally divided white over pearl grey bicolour . The grey stripe has a narrow white stripe at its upper end. In the centre of the flag is the company�s logo: in a red rectangle a blue capital "Y" superimposing two white halfs of a capital "M". The grey and white version seen in Hamburg is still in use.